Urghh! Another great idea of mine telepathically stolen. Rent-a-pet. I can barely take care of myself, and I travel too much but more than anything I would like a 'bat dog' ie boston terrier. They are insanely weird looking and make me happy just to be around their spunky personalities. So, I was thinking to myself, maybe I could just rent one for a few hours? Well, that's exactly what FlexPetz.com offers. Flexpetz takes in dogs that can no longer be cared for and gives them a foster kind of situation. It also makes sure you are properly trained and go through the proper courses. I just like the idea of an abandoned foster dog to get some love for a few days... and maybe some preferential treatment if hes a bat dog. Ok I love the concept of this. 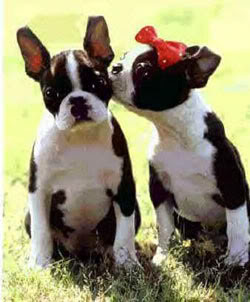 And i totally went to the website and saw the cutest Boston terrier named Pirate, all big eyed and puppy like. I want him. I only fear that these dogs will go through a lot of emotional issues with random people borrowing the dogs, ex. they stop eating when they dont see a person they become attached to for a while. Good idea but I wanna see it pan out first. And I took your advice about the Starburst, sounded like a good idea but the goo just felt odd. Tasty......but odd. I was caught in the middle of liking them or cautiously buying another pack. You've caused a conundrum for me Katie. On a more serious note - I hear what you are saying about the pets. Its kind of the same thing in any kind of foster care. Would like to see it pan out if it was in their well being.